Algerian footballer Riyad Mahrez won the Confederation of African Football's Player of the Year award on 5 January 2017. Algerian teacher, artist, and writer Djamel M'Rah was announced as the Panda Champions for Global Goals by the United Nations Development Programme (UNDP) on 5 January 2017. The aim of the recognition is to build a team of enthusiastic individuals from around the world to achieve the UN sustainable development goals by 2030. Algerian athletes Abdellatif Baka and Fouad Baka won the Difficult Challenges Award (People of Determination Category) at the 9th Mohammed Bin Rashid Al Maktoum Creative Sports Award ceremony held in Dubai on 10 January 2018. The prime ministers of Algeria, Libya and Tunisia agreed on 12 January 2013 to enhance security along their common borders in an attempt to fight the flow of arms and drugs and organized crime in the politically turbulent region. Algeria and the European Union on 13 March 2017 signed a €40 million package agreement that will help Algeria diversify its economy and improve its business climate through development of renewable energy and public finance reform. Algeria and Chad on 18 March 2014 signed seven bilateral cooperation agreements in key sectors, including trade, information and communication technology, training and education, among others. Monts de Tlemcen reserve in Algeria, an area of great biodiversity, which also has major archaeological sites, was added to the list of UNESCO World Network of Biosphere Reserves on 19 March 2016. The list recognizes regions that have maintained a healthy economy while hanging on to significant environmental values. Algeria was named as the third most attractive investment destination in Africa, according to the Africa Investment Index 2018 published by Quantum Global Research Lab. The UN Economic and Social Council on 19 April 2017 elected Algeria as a member of its Commission on the Status of Women for a four-year terms. H. E. Mr. Cherif Rahmani, Minister of Environment of Algeria, was named one of the recipients of the United Nations Environment Programme (UNEP) Champions of the Earth Award on 19 April 2007. Mr Rahmani was honoured for advancing environmental law and for addressing the issues of deserts and desertification in Algeria. Algerian footballer Riyad Mahrez became the first African to be crowned Professional Footballers’ Association (PFA) Player of the Year on 24 April 2016. Association El Badr, Association d’aides aux malades atteints de cancer (the El Badr Association, Cancer Patient Association) from Algeria was awarded the 2018 State of Kuwait Health Promotion Foundation's 2018 His Highness Sheikh Sabah Al-Ahmad Al-Jaber Al-Sabah Prize. Algeria and other thirty-seven countries met internationally-set hunger eradication targets set for 2015 to halve the percentage of hungry people well ahead of time, the United Nations food agency revealed on 12 June 2013. Algeria recorded their first FIFA World Cup win for 32 years beating South Korea 4-2 on 22 June 2014 and became the first African team to score four goals in a World Cup match. Algerian boxer Ouidad Sfouh won the ladies bantamweight title at the 2017 African boxing championships beating the Central African Republic's Marline Niambongui. On 5 July 1962 the Algeria became independent from France after eight years of independence Movement. Algerian state energy firm Sonatrach and E.ON from Germany have made further oil and gas discoveries in the Rhourde Yacoub license area in Algeria, according to an official statement on 18 July 2012. Algerian researcher Dr. Hassina Mouri was awarded by the African Union for her work as a professor of geology at Johannesburg University in South Africa at the 11th anniversary ceremony of the Union on 9 September 2010. Thailand's top oil and gas explorer PTT Exploration and Production (PTTEP) successfully discovered crude oil in the 4th and the 5th exploration wells in Hassi Bir Rekaiz project, Algeria, according to an official announcement on 21 September 2012. 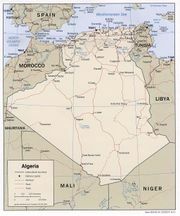 Algeria was admitted as a member of the United Nations (UN) on October 8, 1962. Algeria has made a new oilfield discovery with estimated reserves of 1.3 billion barrels in the region of Tamguid Messaoud near Ouargla city, Algeria's energy minister Youcef Yousfi announced on 26 October 2013. Algeria was elected as a council member of the International Telecommunication Union (ITU) on 27 October 2014 for four years from the African region. ITU is the United Nations specialized agency for information and communication technologies. The United Nations General Assembly on 12 November 2013 elected Algeria to serve on the UN Human Rights Council (HRC) for a period of three years beginning on 1 January 2014. Algeria on 19 November 2013 qualified for the 2014 FIFA World Cup in Brazil on away goals thanks to a 1-0 win over Burkina Faso, triumphing 3-3 on aggregate. Algeria launched its first satellite AlSAT-1 on 28 November 2002 following the creation of the Algerian Space Agency in January of that year. This disaster-monitoring satellite served over seven years before completing its mission in 2010. Algerian footballer Yacine Brahimi was named the 2014 BBC African Footballer of the Year. Yacine became the first Algerian to win the award, which is decided by football fans. Algeria's first communication satellite, Alcomsat-1, was successfully launched into a preset orbit from the Xichang Satellite Launch Center on 11 December 2017. Algerian footballer Riyad Mahrez won the BBC African Footballer of the Year 2016 award for his sessional form with Algerian football team and Leicester City in 2016. Zohra Bensemra of Algeria was named as the Guardian's Photographer of the year 2017 for her images taken in Somalia, Iraq, Syria and Algeria. Leila Zerrougui of Algeria was appointed as the Head of the United Nations Stabilization Mission in the Democratic Republic of the Congo (MONUSCO) on 27 December 2017. Algeria and Egypt on 29 December 2014 signed an agreement to import liquefied natural gas (LNG) from Algeria, as Egypt seeks to ease a chronic energy shortage. This page was last edited on 31 March 2019, at 13:58.